SOUTH CANAAN, PA [OCA Communications] — At a special session of the Holy Synod of Bishops of the Orthodox Church in America held at Saint Tikhon of Zadonsk Monastery here Friday, May 27, 2005, His Grace, Bishop Tikhon of South Canaan and auxiliary to His Beatitude, Metropolitan Herman, was elected Bishop of the Philadelphia and Eastern Pennsylvania. Bishop Tikhon’s election followed a special assembly of the Diocese of Philadelphia and Eastern Pennsylvana held at the monastery two days earlier, during which he was nominated to the vacant episcopal see by parish clergy and lay delegates. Metropolitan Herman, who chaired the Holy Synod’s special session, had headed the Eastern Pennsylvania diocese for over two decades. He continued to oversee its life after his election as OCA Primate in July 2002. The see was declared vacant at the Holy Synod’s spring 2005 session, at which it was announced that Metropolitan Herman would assume duties as ruling bishop of the newly formed Diocese of Washington and New York on May 1. 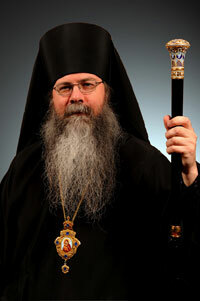 Bishop Tikhon was born in Boston, MA on July 15, 1966, the son of Francis and Elizabeth Mollard. After brief periods living in Connecticut, France, and Missouri, he and his family settled in Reading, PA, where he graduated from Wyomissing High School in 1984. In 1988 he received a Bachelor of Arts degree in French and Sociology from Franklin and Marshall College, Lancaster, PA, after which he moved to Chicago. In 1989 he was received into the Orthodox Faith from Episcopalianism and, in the fall of the same year, he began studies at Saint Tikhon’s Seminary. The following year he entered Saint Tikhon’s Monastery as a novice. After receiving his Master of Divinity degree from Saint Tikhon’s Seminary in 1993, he was appointed instructor in Old Testament at the seminary. He subsequently served as senior lecturer in Old Testament and taught master level courses in the prophets, the psalms, and wisdom literature. He also served as an instructor in the seminary’s extension studies program, offering a number of courses related to the Old Testament. Archimandrite Tikhon collaborated with Igumen Alexander [Golitzin] in the publication of The Living Witness of the Holy Mountain, published by Saint Tikhon’s Seminary Press, by illustrating this classic book about Mount Athos. In 1995 he was tonsured to the lesser schema and given the name Tikhon, in honor of Saint Tikhon, Enlightener of North America and Patriarch of Moscow. Later that year he was ordained to the holy diaconate and priesthood at Saint Tikhon’s Monastery. In 1998 he was elevated to the rank of igumen, and in 2000 to the rank of archimandrite. In December 2002, he was appointed by Metropolitan Herman to serve as the monastery’s deputy abbot. Archimandrite Tikhon was elected to the episcopacy by members of the Holy Synod of Bishops at their October 2003 session. His consecration was celebrated on February 14, 2004 at Saint Tikhon’s Monastery. Additional information concerning Bishop Tikhon’s installation, as well as further information on the special session of the Holy Synod, will be posted on the OCA web site at http://www.oca.org.